If you’re looking for delicious and healthy twists on traditional holiday recipes, then you want to check these out! 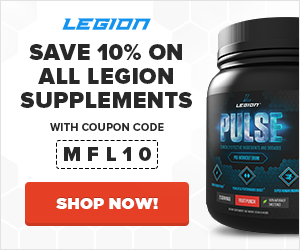 All of us get a bit loose and fast with our meal plans during the holidays to allow for some decadence, but that doesn’t mean we have to spend much of the season in a guilt-infused food coma. These 7 holiday recipes are creative takes on the traditional, and are indulgently good but also nutritious, thanks to the inclusion of season vegetables and other nutrient-packed foods. And as we’re on the subject of holiday cooking, let’s not forget the healthy pumpkin recipes, either–they’re so, so good. 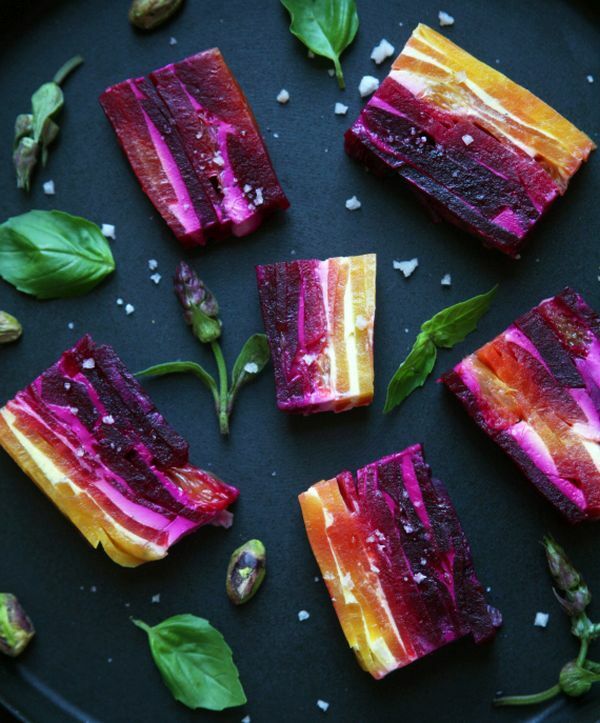 This gorgeous appetizer looks labor-intensive, but assembly requires little more work than slicing, cooking, and stacking the beets. Then you leave the beets and goat cheese to transform overnight. Look for a variety of shades, including golden beets and red beets, to make this standout on the table. Simply serve with a crunchy, wholesome bread or a salad of mixed greens. 1. Cook the beets in boiling water until soft, about 30 minutes. Peel and let cool. Slice very thin. 2. Line a bread tin with plastic wrap, leaving enough overhang to be able to fold it over to cover the terrine. 3. Starting with the lighter colored beets, layer the beets and goat cheese, as if you were making a lasagna. Don’t worry if the layers at even. Season with salt and pepper and a small drizzle of olive oil between layers. Finish with the red beets on top, and fold over the plastic wrap to cover the top. 4. Place a weight on the terrine so it compressed. Add a similarly sized bread tin on the top, and place a heavy object inside, such as a can of soup or veggies. Place in the fridge for a minimum of two hours, preferably overnight. 5. When ready to serve, pull the terrine out of the tin to slice on a board. Unwrap the terrine, and carefully slice about ½” thick. Use a spatula to transfer the beet-goat cheese jewels to a serving platter, and sprinkle with coarse sea salt. This chef-style dish is perfect for a fancy get-together of any kind, either as a generous appetizer or a vegetarian entrée. If goat cheese isn’t your thing, switch it out for white cheddar. You can also trade the pomegranate for another seasonal fruit, such as apples or quince. 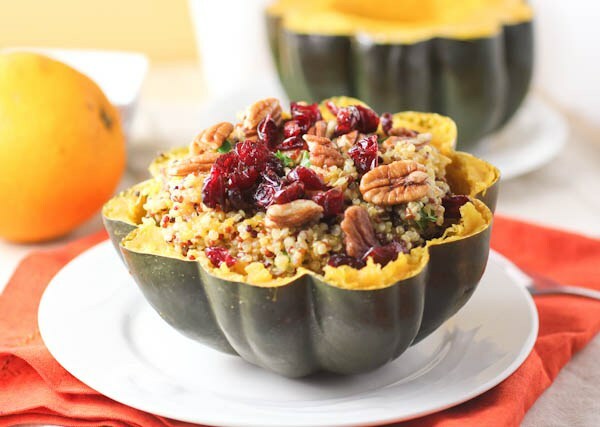 In fact, no matter what kind of whole-grain mix you stuff the acorn squash with, it will turn out delicious with your favorite combo of fruit, nuts, and/or cheese. 1. Preheat the oven to 400°F. Slice squash in half, scoop out seeds, and discard or save for roasting. Place squash halves cut side-up in a baking dish filled with ¼” water to avoid burning. Spray/brush both sides with olive oil and sprinkle with salt. Bake for 50 minutes. 2. Meanwhile, rinse quinoa before adding to a small pot with water. Bring quinoa and water to a boil, and then reduce heat to low and cover the pot. Simmer until the water has been absorbed, about 14 minutes. Set aside. 3. In a small pan, sauté onion in a bit of oil over medium heat for about 5–7 minutes. Add to pot with cooked quinoa. 4. Along with the pomegranate seeds, pecans, maple syrup, and salt. Fold in crumbled goat cheese. 5. Spoon quinoa mixture evenly into roasted squash halves (you may have some leftover), and bake for 10–15 minutes. Serve hot. Even for an indulgent holiday meal, bread doesn’t need to be just processed white flour and butter. Why not sneak in a superfood – and then balance it out with a crowd-pleasing flavor like beer? 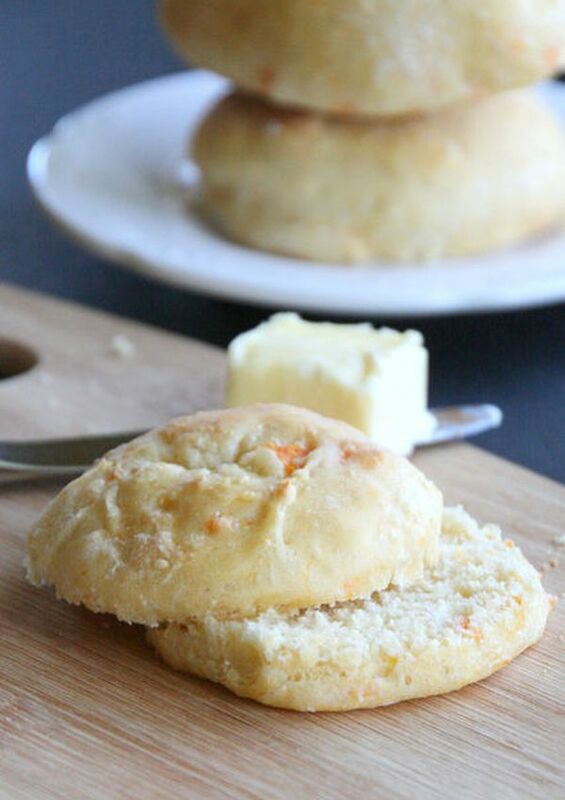 These memorable dinner rolls will be such a hit, they’ll become a favorite part of your family’s special occasions for years to come. 1. In the large bowl of a stand mixer, combine the flour sugar, and yeast. 2. Heat beer in the microwave for 30–40 seconds. 3. Add beer to flour mixture, and pulse until moistened. 4. Add vanilla, egg yolks, coconut milk, sweet potato, and salt. Mix for 1–2 minutes, or until dough pulls together. It is very soft and moist. 5. Place dough in a lightly greased bowl, and cover it with greased saran wrap. Let rise for 90 minutes, or until doubled in size. Move bowl to the refrigerator to continue rising for another hour. 6. After the second rise, transfer dough from the refrigerator to a floured work surface. With floured hands, punch down the dough. Divide into 12 circles (for example, using a biscuit cutter). 7. Place rolls on a lightly greased cookie sheet, and let rise for 30 more minutes. Preheat the oven to 350°F. 8. Bake the rolls for 10 minutes. Let cool for a few minutes before serving. Cooking a global fare to mix things up? Try this lamb and rice dish, called talchin, which is probably like nothing you’ve tasted before. Preparation involves steaming most of the ingredients together in a saucepan before making the rice. Then the spinach, meat, and rice are layered together to cook again, becoming infused with saffron. 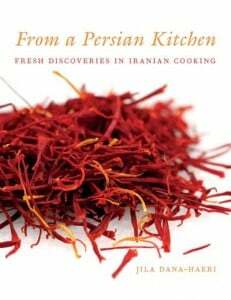 Once you fall in love with these flavors, look for more recipes in From a Persian Kitchen: Fresh Discoveries in Iranian Cooking. 1. Wash the rice several times and soak in cold salted water. 2. Wash and trim the lamb, cut into approximately 4” chunks and sprinkle with salt. 3. Peel the onions, cut one into 4 pieces and finely chop the other. 4. Wash the spinach, discard the tough stems, dry in a salad crisper and chop with a wide-bladed knife. 5. Mix the yogurt and 4 tablespoons of liquid saffron and beat the egg into the yogurt, add salt to taste. 6. Choose a heavy-based saucepan, preferably non-stick and large enough to allow room for all the ingredients to steam well together. 7. Heat 2 tablespoons of oil and lightly fry the onion chunks, add the meat, 1 teaspoon of turmeric, 1 tablespoon of liquid saffron, salt and pepper. 8. Add the boiling water, stir well, bring back to a boil, reduce the heat, cover and allow to simmer for 1 to 1 1/2 hours. The meat should be almost cooked by this stage. 9. In a frying pan, heat 2 tablespoons of the oil and fry the chopped onions until golden. 10. Add the chopped spinach and fry for 5 to 10 minutes. The spinach will shrink in volume considerably. 11. Add the rest of the turmeric, salt and pepper, stir well and remove from heat. Set aside to cool. 12. Make the rice in the same pan that the meat has been cooked in. Take the meat pieces out and put to one side. 13. Add enough cold water to the already existing juices in the pan to end up with a volume of 15 fluid ounces. 14. Add one dessert spoon of salt and bring to the boil. 15. Drain the rice and add to the pan with 2 tablespoons of oil and half of the butter and a tablespoon of liquid saffron. 16. Gently simmer on medium heat until the water has evaporated, and small holes start to appear on the surface of the rice. 17. Empty the rice into a large colander or a bowl. 18. 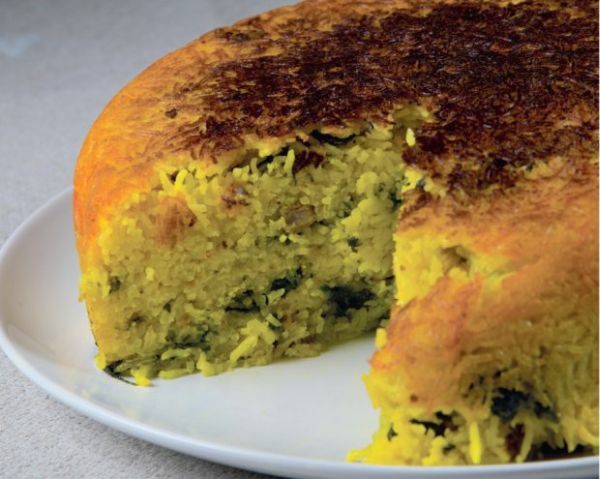 Mix the rice with the meat and yogurt saffron mixture, making sure that the meat pieces are coated with yogurt and saffron and evenly distributed. 19. Return the pan to the heat, add 2 tablespoons of oil and 1 tablespoon of liquid saffron. 20. When hot, place some of the rice and meat mix evenly in the bottom of the pan, reduce the heat to low and add a layer of the spinach and onion mixture. 21. Continue alternating a layer of rice and meat with a layer of spinach to the top, making sure that the spinach layer is distributed evenly and thinly. 22. Add to the pan the rest of the butter, oil and any liquid saffron that is left. 23. Wrap the lid in a tea towel and jam tightly into the pan. Steam the rice for at least 1 hour. 24. Remove from the heat and stand the pan in ¾” of cold water in the sink for a couple of minutes to loosen the tahdig. 25. If you have used a non-stick pan, turn the rice upside down onto a flat dish. Alternatively, take the lamb pieces out and arrange in a flat serving dish and then spoon the rice over the lamb. Sometimes a simple preparation of vegetables looks, well, simple. But you’ve got to step it up a notch for a mouth-watering holiday table. This dish, however, defies the ordinary with an easy preparation yet spectacular presentation. It’s healthy too with little more than root veggies, pumpkin, and seasoning. 2. Slice the squash and carrots into long, narrow pieces. Halve the shallots and small potatoes. Slightly smash the garlic cloves, and crush the rosemary to release the oils. 3. Grease a baking dish with olive oil. 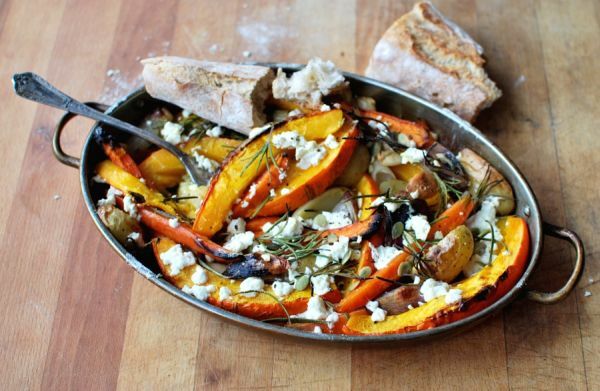 Arrange squash, carrots, shallots, potatoes, garlic, and rosemary. Drizzle with remaining olive oil. 4. Bake for about 45 minutes, stirring halfway through. 5. Top with freshly ground pepper, crumbled feta, and roasted pumpkin seeds. What would an American celebration be without some form of potatoes? There are so many versions to choose from–fried, baked, mashed, and scalloped–but most of the traditional preparations involve gobs of butter and sour cream, which means lots of taste but also lots of calories. You can reduce the fat content without sacrificing the “wow,” however, with a recipe like this, which calls for smoked paprika, but use any seasonings that will make your guests swoon. 1. Preheat the oven to 425°F, and set the rack in the middle of the oven. 2. Lay potatoes flat on cutting board, and starting from one end of the potato, make slits about 3–4 mm apart, finishing about ¼” from the base of the potato. Be careful not to slice all the way through. The potato will fan out a bit as it bakes. 3. In a small bowl, combine olive oil, garlic, salt, pepper, smoke paprika, and 1 oz. Parmesan. Carefully insert pinches of the mixture between the slits of the potatoes. Rub the outsides with residual oil. 4. Arrange prepared potatoes on a baking sheet, and bake for about 40–45 minutes. 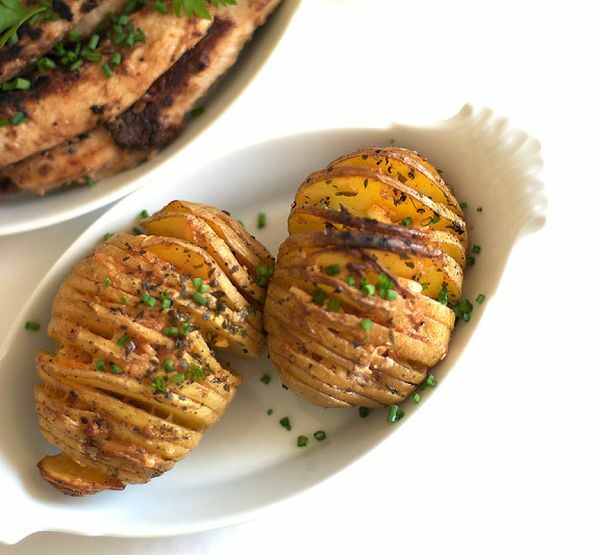 The inside should be cooked through, and the outside of the potato will get crispy. Garnish with additional seasonings, Parmesan, and chives. 5. Serve hot with optional toppings like sour cream, butter, and bacon (not included in nutrition facts). Roast duck is perfect for an extravagant feast, but no matter what meat is the best centerpiece for your family’s holiday table, there’s an expert way to prepare it in this must-have guide to meat. 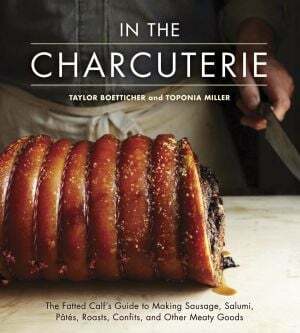 This recipe is from In The Charcuterie: The Fatted Calf’s Guide to Making Sausage, Salumi, Pates, Roasts, Confits, and Other Meaty Goods, which is a cookbook for serious carnivores–it’s a fully-illustrated guide that includes step-by-step instructions for preparing protein-packed sides and entrées, including how to butcher your choice cuts by yourself. 1. A day before dinner, in a small saucepan over medium-high heat, stir together the wine, sugar, bay leaf, thyme sprig, peppercorns, allspice, and a pinch salt. Bring to a simmer and stir until the sugar dissolves. Remove from the heat, add the figs, and cover. Let cool to room temperature and then refrigerate overnight. 2. A couple hours before dinner, preheat the oven to 375°F. Fit a roasting pan with a rack. 3. Trim any glands or blood vessels from the duck. Pat it completely with paper towels, and place it on a cutting board. Open the duck up like a book, use salt and pepper to season the skin and underneath it, and turn the duck skin-side down. 4. Drain the figs, trim the stems, and then quarter each fig lengthwise. In a bowl, combine the figs, sausage, farro, hazelnuts, chopped thyme, and parsley. Pat the stuffing into a cylinder about 3” in diameter and 3” shorter than the length of the duck. 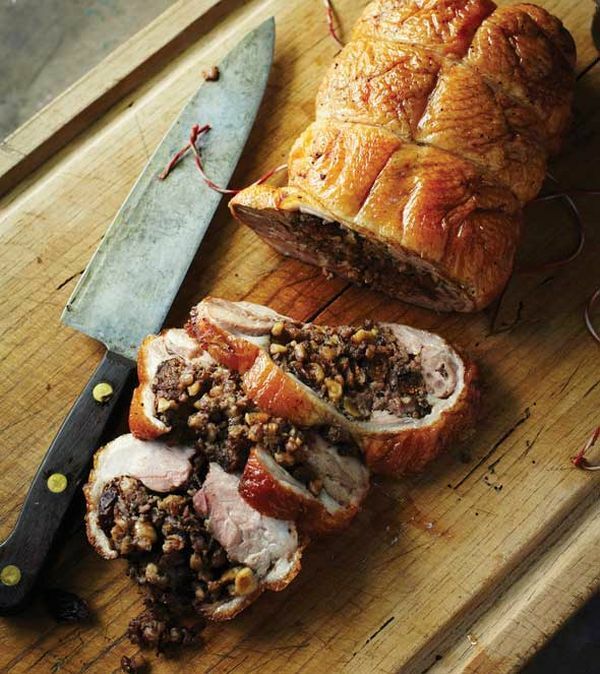 Place the stuffing directly in the center of the duck and roll the meat tightly around the stuffing. Tie the duck every 2” or so with a separate piece of kitchen string. Using the tip of a sharp knife, lightly score the duck skin in a crosshatch pattern to facilitate the release of fat during cooking, being careful not to cut the string. 5. Place the duck on the rack and roast it, basting the duck with the drippings that accumulate in the pan 3 or 4 times, for about 60 to 90 minutes, until a thermometer inserted into the middle of the farro stuffing registers 160°F. If the skin starts to get a little too brown, you can lower the oven temperature to 325°F so the duck finishes more slowly. 6. Remove the duck from the oven and let it rest for 10 minutes. Carve into slices about 1” thick, removing and discarding the string. Serve immediately. What did you think of these healthy holiday recipes? Have anything else to share? Let me know in the comments below!